Scully is diagnosed with brain cancer. As Scully begins treatment alongside Penny Northern, the last survivor of the group of women abductees she had met a year ago, Mulder finds that these women were treated for infertility. 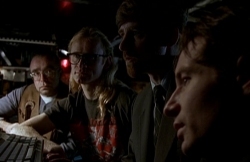 With the help of the Lone Gunmen and the ‘Kurt Crawford’ cloned hybrids, Mulder reaches the place where the ova of the abductees are being stored. Penny dies and Scully decides to quit chemotherapy and to go back to work. Skinner starts bargaining with the Cigarette-Smoking Man for Scully’s life. Memento Mori, goddammit, NOT Momento! ‘Memento Mori’ means ‘remember death’, or'[always] remember [that] death [lies at the end]’; it’s a 17th century humanist saying, along with ‘Carpe Diem’ (‘seize the day’/’make the most out of the day’, famous from Dead Poets Society). This is the highly emotional episode written by 4 (!) writers (that is, Carter, Spotnitz, Gilligan and Shiban) that earned XF a nomination for an Emmy in the writing category. Even if the series could easily fall into melodrama and cheesy crying scenes, the scripts and the lead actors made it possible to tell such a heavy story in a serious, XF-special, way. Scully, being the scientist she is, deals with her new cancer in an extremely detached and calm, professional way — an attitude that deserves respect (and not only because this is a female character of ’90s TV). Well, maybe Mark Snow’s music for Scully was too much. But also, for the first time, the music sounds like the soundtrack for Fight the Future (in the Lombard infiltration scene). As Frank Spotnitz says in the DVD commentary, there aren’t really new mythology elements in Memento Mori, only the natural evolution of themes already introduced. In 3X09: Nisei we meet the MUFON group at Allentown, Pennsylvania, and learn that one of them, Betsy Hagopian, had developed cancer because of the removal of her implant. One year later, Betsy and all her fellow abductees have died and Scully is diagnosed with cancer too. Scully and Penny, and probably other Allentown women too, seem to have been in the same ‘abductee group’ as they were tested upon together (Penny: “I held you and comforted you in the place, after the tests.“). Penny and her group have had hypnosis, which has brought many memories to them, and that’s how they know and remember Scully. Scully, on the other hand, was too afraid to proceed with hypnosis (3X01: The Blessing Way). ‘Abductee groups’ must be assembled by geographical location. Scully was added to the Pennsylvania group on short notice after the decision was made to abduct her by the CSM (2X04: Sleepless, 2X06: Ascension). Skyland Mountain (Scully’s abduction place) is in Virginia, which is close to Pennsylvania. The files at Betsy’s lead Mulder to Lehigh Furnace’s Center for Reproductive Medecine, where the group of surviving women abductees was being treated for infertility. This is where they learnt that their abductions had left them barren. Scully’s name is referenced in this clinic’s database (“This is a file directory from a federally operated fertility clinic. Agent Scully’s name is on this file”), although Scully never visited. The Syndicate must have a doctor working in that clinic, opening files for every abductee. So the abductees got barren during their abduction. The ova was “harvested during her abduction, through a high amplification radiation procedure that caused superovulation.” Radiation is indeed used to render barren certain animals for population control (bees for example). But radiation is also the main cause of mutations and cancers (see Chernobyl, or plain solar radiation for skin cancers), and indeed this procedure caused the cancer as a side effect (“Barren now, from the same procedure that caused their cancer.“). It seems that the appearance of the cancer coincides with the removal of the implant, it is likely the implant inhibits the cancerous cells from spreading (see 5X03: Redux II for more). 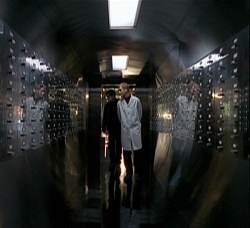 The fertility clinic’s files are “a directory for a mainframe housed in the Lombard Research Facility.” The files at Lombard (hacked by the Lone Gunmen) are similar to what the Thinker had made out of Scully’s charts right after she had been returned from her abduction (2X08: One Breath): “It’s a gene code we’ve seen before, detected in Scully’s blood after her abduction.” “Normal DNA is inactive when in its helical form. When it’s unwound or branched like this one, that’s when it’s active, when it can mutate.” “It’s probably what made her sick.” Most of the time, DNA is twisted on itself, in the form of a the familiar helix. When it’s about to duplicate, in order to make two cells out of one, it untwists and two identical strains of DNA are created out of the original. It’s in this unwound form that changes can be applied most easily, that’s when the hybridization process takes place by mixing different chunks of DNA and ‘activating’ genes and so on. So these are records of her DNA as modified by the hybridization experiments. The Kurt Crawfords are cloned hybrids, like the Samanthas and ‘Gregors’ in 2X16: Colony and the young Samanthas and boys in 4X01: Herrenvolk — Mulder identifies the the Herrenvolk boys in the green tanks as young Kurts too (“I’ve seen this boy before. These boys were you.“). The Kurts are trying to save the women abductees, who are also their mothers. In some sense of the word. Genetically, the hybrids haven’t inherited half of their DNA from their mothers, as is the common definition for a biological parent. The hybrids are created from the original (human) Kurt Crawford and alien genetic material. The hybrid DNA is then inserted into an ova obtained from these women: the ova are used “for fertilization. They constitute one half of the necessary raw materials.” The ova have their nucleus taken off (the DNA is contained inside the nucleus), the hybrid DNA is then injected and the hybrid starts developing. See 2X16: Colony and 2X17: End Game for more details. Ova are frozen and stored for safekeeping in the sealed metallic vault the Kurts show to Mulder. Mulder takes a vial with some of Scully’s ova; this won’t be touched upon again (until season 8). So “these women are your birth mothers.” Kurt: “We’re among the end results.” It is true that the hybrids are used as a workforce not unlike others (Colony, 3X24: Talitha Cumi, Herrenvolk) — here the Kurts are used as lab technicians and to create even more hybrids in the Lombard facility. But the real end result of these experiments isn’t them (see 6X12: One Son) and that is why the experiments continue. Mulder: “You’ve been using me.” Kurt: “Not at all. Your arrival was only coincident with the execution of our objective“, that is to “subvert the project. The project that created us“. After the ‘Gregors’ and the Jeremiahs, it’s clear that they hybrids have a tendency to disobey their orders — which isn’t surprising given the repetitive tasks they’re assigned to. The Kurts try to save their “birth mothers” by searching the medical records and digging in databases trying to find a cure for them, a cure they know exists. The Kurt Crawfords end up being executed too, using the alien stiletto. This time however, we see no Alien Bounty Hunter: the Grey-Haired Man does the job. After 4X01: Herrenvolk and the Jeremiah Smith business, the aliens have given the Syndicate a stiletto with which the Syndicate can take care of its own menial problems internally, without having to mobilize Colonist resources; it’s likely the Syndicate asked for this ‘passage of power’, given the value a stiletto has (Talitha Cumi). After pointing Mulder once to the CSM’s (2X08: One Breath), Skinner talks Mulder out of seeking the CSM for answers. Skinner is always in a difficult position as the middle man. He wants to keep Mulder out of the hole he’s digging for himself with bargaining with the CSM. Skinner goes to CSM and compromises himself again by pleading for a cure for Scully. He knows that by this the deal he made with him in 3X02: Paper Clip on Mulder & Scully’s safety is no more — which was true anyway since Scully’s life is threatened. This pact with the devil continues in 4X21: Zero Sum. Leonard was right (4X14: Leonard Betts): Scully has cancer! We enter an extremely emotional story arc for Scully (and Mulder). Her beliefs are shaken, even though she won’t admit it, and as she becomes aware of the possibility of impending death she is very candid on the log she writes in what is at that time her deathbed — a log that is revealed to be addressed to Mulder. This culminates in the hallway scene, with a hug (and a cut kiss, which indeed could have been attributed to their emotional state, shippers take notice).